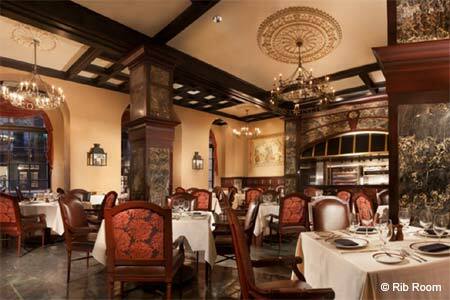 Rib Room offers old-world elegance with a contemporary flair. : A veritable study in longevity, Rib Room harkens to the Camelot era, when people dressed for dinner and never considered a steak without the mandatory icy cold martini. The clubby, softly lit atmosphere is accented by over-size windows that embrace a massive view of bustling, historic Royal Street. Start with New Orleans-style barbecued shrimp with brown-buttered French bread, and move directly into a hearty cut of the house prime rib, slow roasted for hours and served still sizzling. Entrées can be pricey, but sides are built for two diners; try the stone-ground cheese grits or the tasso-flecked macaroni and cheese. For dessert, go traditional New Orleans with warm, bourbon-spiked raisin bread pudding or choose the multi-layered chocolate blackout cake. The wine cellar serves the restaurant best with its respectable collection of full-bodied, hearty reds that complement the beef entrées. We like the always dependable, spicy Heitz Cellar Zinfandel, but if whites are your preference, the list wisely includes the rich, oaky Duckhorn Sauvignon Blanc.